The most common cause of electrical fires in homes is negligence and faulty wiring. 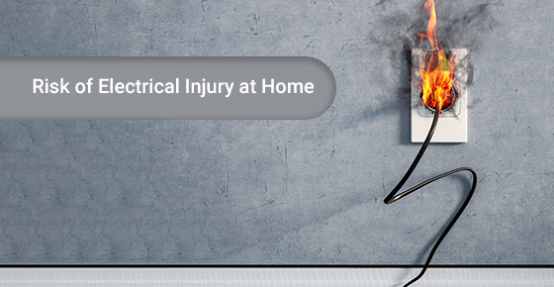 The very least potential injury that may occur is that you will receive an electric shock. Depending on the current and voltage, this can be very serious. A worst case scenario is a serious outbreak of fire. This is why it is important to book an inspection with our licensed and trained electricians. We at Hi-Lite Electric conduct safety checks that identify current, approaching and future electrical issues. The electrical products in your home can pose health risks if used incorrectly. When purchasing electrical products, make sure they comply with Canadian Electrical Safety standards. If so, the following symbols will appear on the product: CSA, cUL or cETL. There are a lot of counterfeit products on the market that are unsafe. You can identify these by their unbelievably low price, unusual product labels and packaging, where the English language usage is suspect. We at Hi-Lite Electric can easily identify counterfeit products for you and our products are all Canadian Standards Association approved. We at Hi-Lite Electric can inspect and make sure your carbon monoxide alarms are working. We are available for emergency service, troubleshooting and repairs, upgrades and home renovations and always for safety checks. Concerning home renovations and upgrades, you may want to check out the OESA for information on safety codes and rules. You can contact them at Ontario Electrical Safety Authority. Your clothes dryer needs to be cleared of lint every time you use it. If lint builds up, it is subject to heat that can ignite and this becomes a fire hazard. Electrical chargers used in your home should be the one that came with each individual product. The voltage and current need to be compatible with each device. Never leave battery operated products on soft surfaces, such as beds, as heat can become trapped and, once again, there is the risk of fire. Power cord home usage needs to remain safe. Never pull a plug out of the wall outlet by the cord. If you do this, you are at risk of electric shock. Also, never remove the third grounding prong from plugs. It is there to ensure you do not receive an electric shock. You must be diligent in keeping power cords from overheating. Things you can do to be safe are: unroll the cord completely before use, do not run them under rugs and never use them near heat sources, such as radiators. These are precautions that our electricians at Hi-Lite Electrics will educate our customers about. Prevention of electrical problems and emergencies is paramount to us. In electrical emergency situations, Hi-Lite Electric Inc. will be there when you need us – day or night – 365 days a year. Just give us a call and we’ll send a licensed electrician to your home to perform any electric repair services! We offer power surge protection, so that in the case of common power surges, either from electrical storms or otherwise, spikes or voltage impulses do not cause problems with your electrical products. Think of all the electronics you have in your house, and having to repair or replace them. Certainly a costly venture, not to mention a potential loss of electronic information. For a worker in Ontario, the odds of going home at least once this year because of an electrical injury at work is about 1 in 82,000. * (*This is average across the workforce – if your work requires you to be in close proximity to exposed, energized, conductors, the likelihood will be much higher). We at Hi-Lite Electric Inc. make sure that our electricians are trained to find your problem efficiently and most importantly, safely. What you may not encounter with other electric companies, is that for further safety assurance, we guarantee that our electricians are drug- free. This puts our electricians, our clients and everyone involved onsite in as safe an environment as possible. With so many Canadian electrical safety associations providing current information and regulations, we at Hi-Lite Electric and our clients are fortunate to be protected and safe from electrical problems and emergencies. When you do require our services, our electricians will assess and repair your problem with the utmost safety in mind and will do so quickly and efficiently. With same-day service and upfront pricing, we stand out from the rest! For more information about how to protect yourself from electrical hazards, contact Hi-Lite Electric today.